Meat squid tasty and tender, however, the incorrect the process of cooking these seafood leads to disastrous results. Squid dishes should have high taste qualities. The taste and aroma of properly cooked calamari is reminiscent of lobster meat and finished product must not smell of fish. Use boiled squid for salads, soups, stewing and frying. Learn the simple secrets and tips. When buying squid, pay attention to their appearance. Squid should be easy to separate from each other, even if they are frozen. Meat colour of fresh squid is white, not to be confused with the color of the film that covers the carcass, it can be from pinkish to purple. Squid should be cleaned from the film. Drop the frozen carcasses in hot water, the skin will coagulate and the meat will recede itself. Remove the remains of the film under running water, remove the innards. Cook squid meat in the simplest way – boil. Cook them no more than three minutes or all 30. Note, in the second case, the meat will become tender and soft, but you will lose useful quality. In order to cook squid meat, dial in a pot about 2 liters of water, boil, salt, add the Bay leaf. Lower one defrosted, cleaned squid, give it a little boil, count to ten and then remove with a slotted spoon. Repeat with the remaining squidmi. The taste of the meat of squid will turn out incredibly tender and soft. Pour the cooked squid in any sauce and eat as a main dish. 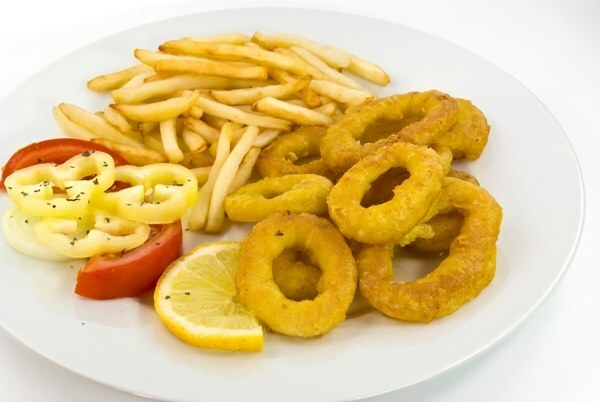 Prepare the salad with squidmi, or rings, fry in deep fat. Try the soup of squid. Take a small saucepan and put about 0.5 kg parsed into florets of cauliflower, add the chopped carrots and onions. Pour the vegetables with cold water so that it lightly covers them, add salt and cook on low heat for 30 minutes. Drain the broth into another bowl, chop the vegetables. In the resulting puree, add heavy cream and mix with the broth. Squid cut into thin rings, put in a pan with vegetable puree, boil. Serve the soup hot squid. Of the squid can be cooked many different dishes. The seafood combined with almost any vegetables, nuts and even some fruit.